With the Olympic Games about to begin, it seems like a good time to write about the ties sport has with dying and death. I have been writing about running – track, cross-country, road racing – for various publications for more than 50 years. 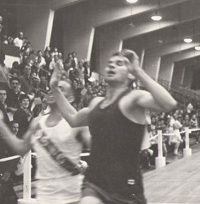 When one of my running friends – one who had read my book, Running on Third Wind – recently came upon my book, The Afterlife Revealed, he asked me how I (below, 45 years ago) could possibly have such divergent interests. I responded by telling him that the two are very closely allied. In fact, running is all about dying. A foot race of any distance can be viewed as a microcosm of life. There is a start (birth) and a finish (death or liberation). Between those two points, there is an unfolding – from awkwardness to rhythmic movement, from strength to weakness, from high vitality to depletion, from youthful exuberance to weariness, often reaching a point of near collapse at the finish. The objective is to have expended every ounce of energy as the runner reaches the finish line. 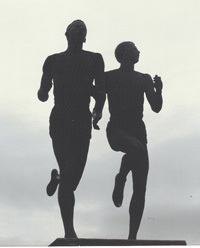 A runner who does not ration his or her energy over the length of the race might say that he or she has “died” before the finish. When divided into four parts, the race can be viewed as spring, summer, autumn and winter. The mile run lends itself to being divided into four equal parts more than any other standard racing distance. Moreover, the mile is said to be the most balanced running event, requiring equal amounts of strength (anaerobic capacity) and endurance (aerobic capacity). And so it seems with life. And as in life, the miler often experiences fear, doubt, apprehension, anxiety, suffering, and frustration. He (or she) strives, struggles, suffers, surges, and surmounts. He sometimes surrenders and he sometimes soars. Applying a standard unit of time – a minute a quarter – we see a special symmetry to the mile and significance to the challenge of running four laps in four minutes…or under. Covering a mile in four minutes can be looked upon as symbolic of the perfectly paced life – a life of principles, patience, persistence, and perseverance, a life in which suffering is essential because it touches the soul and awakens the spirit. The first lap of the race is like spring and youth. The runner is fresh, spirited, impulsive and possibly even reckless. There is a kind of awkwardness in the early strides as one must find a rhythm. The key on the first lap or quarter is discipline. Unless proper restraints are applied during this lap, the ordeal ahead will be especially difficult. To many of us already on life’s final lap, it appears that most of today’s young people do not have that discipline, i.e., are not properly restrained. Seduced by mammon and spurred on by the follies and fantasies instilled in them by an increasingly hedonistic, celebrity-worshipping culture, youngsters today appear to be running mindlessly and with reckless abandon in the outside lanes while trying to cover the first lap in 50 seconds, a pace which will most definitely take its toll in the early part of the second quarter. The second lap is like summer and young adulthood. There is a striving for position as the heat of the battle begins to intensify. Settling into a good position with the necessary rhythm is the key to the second lap. Without the proper discipline on the first lap, this will likely be very difficult. It’s during this second quarter of life that we are establishing ourselves in our careers, developing relationships, marrying, raising children, starting to build a nest egg. For most, it requires considerable effort, but that effort is still not fully discernible. We have been conditioned to take it in stride, even though most of us often stutter-step, stumble and stagger as we become “boxed in” or trapped within prisons of own creation. It’s often dog-eat-dog, every person for him- or herself as we strive for a favorable position toward the front. The gracious and ethical participant can be easily elbowed and tripped up, possibly falling flat on his or her face and never getting back into the race. We want the inside track but are often forced to the outside lanes because there is too much ambition, too much selfishness, too much greed on the inside. It’s often plain luck, perhaps fate, which permits the beneficent person to maintain a favorable position. So many well-meaning and gentle souls, though, are unable to adapt to the vainglorious infighting up front. They fall behind and must be content with simply finishing the race out of the medals. For those who have properly paced themselves through life’s first two laps, the third lap can be the most comfortable and serene. By middle age, many people have fully established themselves in homes and occupations and are no longer fettered by child-raising. The passions of youth have been sufficiently quelled and the infirmities of old age not yet encountered. It is the calm before the storm. Many others – those who have not properly paced them themselves through the first two laps – are, however, already “crashing and burning.” The flotsam and the jetsam they have left on the track can obstruct and hinder those still maintaining a strong, steady pace. The last two laps can turn into more of a steeplechase, with its water jumps and hurdles, than a flat, smooth, rhythmic event. Maintaining focus and composure in spite of the distractions around us while holding something in reserve is the key to the third lap. Then, winter and old age – the gun or bell lap. The last of the life-giving oxygen begins to seep from the body and some form of arthritis attacks the joints. The muscles are no longer supple and feel the strain. Fortitude and mental toughness are the keys. For those who have failed to properly pace themselves, the last quarter will be extremely painful. It becomes increasingly clear to them that their hopes will go unrealized, their ambitions unattained, their desires unfilled. If they have been unable to escape the jaws of mammon – unable to develop a spiritual outlook on life – they may see the finish line as extinction, obliteration, nothingness. They bury the idea of death deep in the subconscious and then busy themselves with their jobs, partake of certain pleasures, strut in their new clothes, show off their polished cars, worship celebrities, hit little white balls into round holes, escape in fictitious stories in books, at the movies, and on television, experience vicarious thrills a sporting events, and pursue a mundane security that they expect to last indefinitely. But even those maintaining a proper pace may begin to question their resolve, as the finish line looms ahead like death. “The tape meant finality – extinction perhaps!” Roger Bannister, the first man to run a mile in under four minutes, recalled thinking during that historic race in 1954. Bannister finished in 3:59.4, but it was not the end. The greatest part was yet to come – liberation! “No words could be invented for such supreme happiness, eclipsing all other feelings,” he wrote, adding that he felt bewildered and overpowered. Though completely spent, the well-conditioned runner will recover within a matter of seconds after finishing. The runner who was not properly prepared for the race will take much longer to recover. The totally unconditioned person attempting to run an all-out mile might take hours or days to feel normal again. And so it seems with the afterlife – the spiritually-evolved person quickly transitioning, awakening, and adapting to his or her new environment, those not so spiritually evolved awakening more slowly, often disorientated and earthbound. Those fully immersed in the mundane, clothed in the grossness of matter, slaves to materialism may not fully grasp or appreciate the analogies or metaphors here. They likely do not understand that the willpower required for an all-out run is a function of spirit and that spirit is the manifestation of soul. However, for those willing and able to see it, the mile run can be one of life’s greatest teachers. 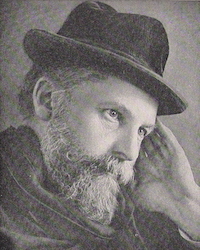 When the Society for Psychical Research (SPR) was founded back in 1882, the primary focus was said to be the study of what was then called thought-transference, renamed “telepathy” by Frederic W. H. Myers, (below) one of the SPR founders. Had Myers and the other SPR founders admitted that they were really searching for evidence of the survival of consciousness after death, or a spirit world, mainstream science would have scoffed and SPR members would have been called a bunch of lunatics. In the wake of Darwinism, which kicked off in 1859, science had, by 1882, dismissed matters of religion and spirituality as mere folly and superstition, and no “self-respecting” scientist or scholar would even consider the possibility of life after death. As it was, many materialistic scientists laughed at the idea of mental telepathy – there are still many scientific fundamentalists who reject it – but telepathy (and other forms of ESP) was a pretext of sorts that made the organization somewhat more acceptable to the scientific establishment and the public in general. While the idea of life after death invited scoffs among the “intellectuals,” telepathy was more in the smirk category. Proof of telepathy does not serve directly as proof of life after death. It, however, defies the laws of physics and suggests a non-mechanistic world, thereby opening the door to another reality, one in which life after death is at least a reasonable hypothesis. One of the most fascinating areas in the study of telepathy has to do with twins. Renowned author Guy Lyon Playfair explores this whole area in his book Twin Telepathy. Although surveys conducted by the SPR founders during the 1880s revealed telepathic links between twins, it wasn’t until the 1940s that some academics began to take note of the phenomenon and conduct research. Horatio H. Newman, a professor of zoology at the University of Chicago, appears to have been the first. He reported on a case in which twin sisters prepared for an examination, each studying half of the assigned material. However, each sister was able to write fluently about the half she had not studied. Their papers were so similar that the teacher suspected cheating. It was pointed out, however, that they were too far apart in the exam room for normal cheating to take place. Although not clearly identifying himself in an earlier case of the same nature, Newman is believed to have been one of twin brothers who turned in identical exam papers on a number of occasions, even when placed in separate rooms. In addition to using the same words, the same syntax, and the same grammar, they made the same mistakes. While Newman was inclined to explain such cases as a matter of genetics, he also recognized the possibility of telepathy and urged more research in this area. Unfortunately, because the taboo has persisted, very little laboratory research has been done in this area and most of the evidence is anecdotal. Another intriguing case involved twins Roy and Loy Henderson. Roy was a student at Harvard in 1920, while Loy was serving as a Red Cross volunteer in Estonia. When Loy apparently contracted typhus during an epidemic, he was hospitalized. At a moment when he felt he was dying, Loy reported that his twin brother appeared to him and spoke in great distress of their separation from each other by death. As it turned out, Loy did not have typhus and survived, but shortly thereafter he received a telegram telling of Roy’s death during a tooth extraction. It was determined that Roy’s death occurred at the same time Loy was in the hospital bed thinking he was about to die. Numerous other cases are reported by Playfair in this 173-page book – twins falling and breaking legs at the same time while skiing on different glaciers, twins many miles apart dying on the same day, twins separated for many years meeting each other wearing the same clothes. Playfair suggests that the known stories represent no more than the tip of the proverbial iceberg. “The problem is that those who have the necessary resources, facilities and contracts, with rare exceptions, show no signs of interest,” he offers. “In most of the academic community, telepathy is still taboo, as my own experience indicates.” He tells of the resistance he met at one major twin research institute where a staff member told him they are not interested in getting into the “spooky stuff.” In effect, mainstream science seems to want to write off all such stories as genetics or coincidence. Twin Telepathy by Guy Lyon Playfair is published by White Crow Books and is available from Amazon and other bookstores.